13th December 2012 | filed under Aesthetic Treatments, Botox, Face, Skin. As the first private doctor in Switzerland to have introduced aesthetic Anti-Wrinkle Injections, pain-free hyaluronic acid as well as CO2 laser resurfacing Dr. Phillip Levy has paved the way with innovative procedures producing breakthrough results – and all this with no surgery. To complement the extraordinary clinical results he already achieves with botulinum toxin, hyaluronic acid injections and laser treatments, Dr. Phillip Levy has searched for the most powerful cosmeceutical ingredients to naturally firm, plump and smooth skin. With the discovery of dermal stem cells in 2009 (the cells ultimately responsible for creating and maintaining the fibroblast-collagen-elastin matrix) Dr. Phillip Levy could finally harness the skin’s very own anti-wrinkle system to target aging at its source. What’s behind skin aging? Worn-out, tired stem cells. That’s one of the scientifically proven causes of chronological aging. With time, stem cells in both the epidermis and the dermis weaken; there are fewer collagen and elastin fibers and decreased amounts of hyaluronic acid. As a result, skin becomes dry, thinner, and less plump. And wrinkles start to appear. Cells are like a time machine: they not only remember their youth, but that can actually go back in time. The potential is in your cells; all they need is a gentle wake-up call. 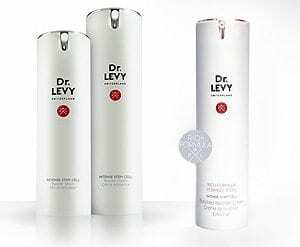 Dr. LEVY Switzerland® works. Its supercharged ArganCellActiv® complex contains exclusively ArganCDV, a plant-derived stem cell extract scientifically proven to boost the vitality of dermal stem cells1. – The source of the skin’s natural wrinkle fighting cells. Combined with epidermal stem cell activators and 9 other concentrated anti-aging ingredients, Dr. LEVY Switzerland® helps vitalize the skin’s own regenerating system, for a visibly smoother, more youthful & radiant looking skin. Each individual organ of the body has its own specific adult stem cells. The skin, for example, is not one unit as many people think but is comprised of two different layers, the outer Epidermis and the inner Dermis. Therefore, it has two distinct populations of adult stem cells: epidermal stem cells and dermal stem cells. Scientifically speaking, to properly demonstrate activation of the skin’s stem cells, different ingredients would have to be rigorously laboratory tested against a pool of human dermal stem cells (harvested simply by miniscule biopsies). This sophisticated and complicated laboratory process has only been available since December 2009, and precisely, Dr. LEVY Switzerland® Booster Serum & Cream are the world’s 1st cosmetics with an ingredient, ArganCDV proven to activate & vitalize human dermis stem cells in vitro. This makes Dr. LEVY Switzerland® treatments the first cosmetics available in the world with an exclusive ingredient – ArganCDV – which has been proven scientifically to activate & vitalize human dermis stem cells in vitro. The Dr. LEVY Switzerland®, cosme-medical skin care regimen includes highly active ingredients within the ArganCellActiv® formula and the skin might appear slightly red (a manifestation of the high activity of the products) at the beginning of the treatment. This has been a rare occurrence and disappears most often very rapidly.